Llandudno operated two of these single deckers on the route from the Town Centre to St Tudnos Church on the Great Orme. This was a continual climb with the steepest section of 1 in 4. The buses were fitted with a ratchet brake to prevent the bus running back down the hill if the engine stalled or the brakes failed. This was operated by a lever in the cab and was activated by the driver at the foot of the steepest section of the climb. My notes made at the time (September 1967) make reference to the clock fitted above the windscreens ‘which is always accurate’. Also, ‘the conductor is responsible for the smart interior condition of the vehicle’. 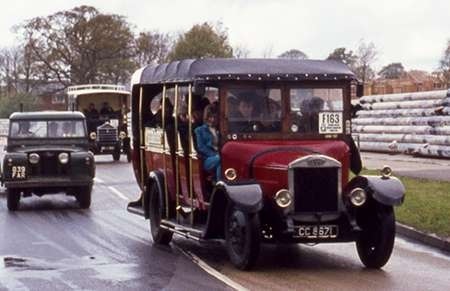 The driver ‘had collected the bus from Fodens Works at Sandbach in May 1951 and had driven it each summer season since’. These two buses were replaced by very rare Dennis Pax single deckers in 1968 allegedly because of the non availability of the 9.00 x 22 tyres fitted to the Fodens. Was the ratchet brake of the same type as fitted to the Foden used on the Bargoed Hill route by West Mon (HWO 590)? And did any other operators use it? Well into the period when 20" wheels were standard for lorries, Foden continued fitting 22" wheels to some of their heavies, but if AJC 91 had been built on a goods chassis I don’t think the downswept body would have been possible, so could the larger wheels have been fitted for ground clearance? Is this confusion does not the ratchet brake refer to the actual handbrake.On goods chassis ratchet hand brakes worked upon the rear wheels only and when correctly adjusted one and a half pulls brought the brakes on,it was the emergency brake on air brake systems without spring brake chambers.Run back brakes or sprag brakes in their early form actually operated by dropping a bar onto the road! Llandudno UDC was one of Britain’s smaller municipal fleets, and unlike most municipalities, it’s services were aimed at tourists rather than local residents. A fleet of small buses was built up for use principally on the Marine Drive, a 5 mile scenic road around the base of the Great Orme, a 679ft high headland which dominates the local scenery. In the early fifties, a second tour was added which took in some of the inland countryside and then circled the Marine Drive. In 1951 a stage service was introduced which connected the town centre with St. Tudno’s Church, near the summit of the Orme. Two Foden coaches were purchased for this spectacular route; it was said that the journey took 17 minutes, of which nine minutes were in first gear! 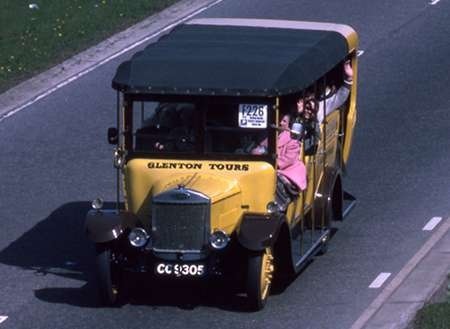 CCC 596 was one of a pair of similar vehicles bought in 1954; they were small enough to operate the Marine Drive tour, but could also be used on the St. Tudno’s stage service at quieter times. Like the Fodens, they were fitted with "Spragg Equipment", a safety device which apparently prevented the vehicles running back on the gradient. These were the last new buses to be bought by Llandudno UDC for fourteen years, until a pair of Dennis buses, based on a lorry chassis, were bought to replace the Fodens. in 1968. On summer Sunday mornings an open air service was held in St. Tudno’s graveyard, and virtually the whole fleet was pressed into service to carry the crowds; the smaller vehicles ran round part of the Marine Drive before climbing a zig-zag road with easier gradients. When new these buses, like the rest of the fleet, were painted maroon and cream. In the late sixties they was repainted blue and cream, a livery introduced on the Dennis’s. In 1974, Llandudno UDC was taken over by the new Aberconwy Borough Council, and the red and grey livery shown here was introduced. 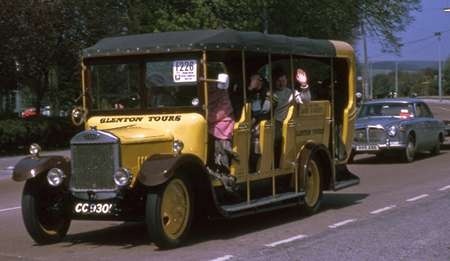 Bedford SB buses were purchased for the St. Tudno’s route, and several second hand Bedford VAS coaches took over the Marine Drive Tour. 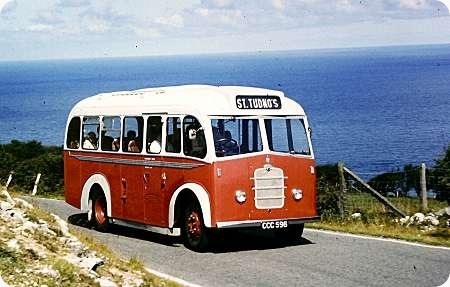 Later the stage service passed to Crosville, which resulted in Leyland Nationals climbing the Grat Orme. At this time the upper terminus was moved from St. Tudno’s to the Summit Car Park. After a spell with minibuses, Crosville’s successor, Arriva, now uses Dennis Darts, although only three journeys a day reach the Summit. 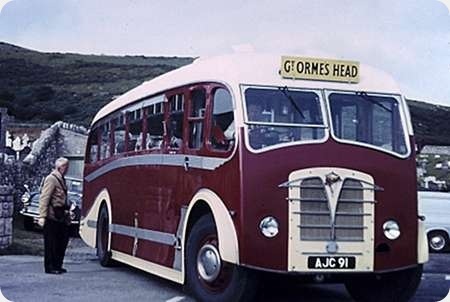 The size limit on the Marine Drive no longer applies, and nowadays Alpine Coaches run "Vintage" tours on the Marine Drive using Leyland Tiger Cubs, while the annual Transport Gathering in May sees a variety of old buses and lorries circumnavigating the Orme. This view shows CCC 596 approaching St Tudno’s Church on the Sunday morning alternative route from the Marine Drive. Nice view, Don, and a very interesting caption. Thanks for posting. I’ve only ever been to Llandudno once, on a boat trip from Liverpool. It was running so late that my parents and I just had time to disembark and join the queue for boarding again! I remember taking the Marine Drive trip in the mid 50’s but we had a small normal control Guy, definitely petrol engined but I don’t know what model. I also remember the Fodens on the mountain route. Formidable looking machines! Here’s a webpage with full details of all the early buses going to Great Orme. I like the Guy Wolf, which had detachable sides. It states that a surprising number of these vehicles survive and there’s a photo of a selection on the GO at the bottom of the page. 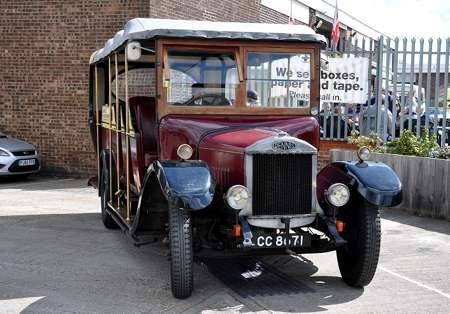 This is shown in Classic Bus 127 and described as a Dennis Stork school bus owned by the former London County Council! Nope this is one of only 2 Guy Otters new in 1954 to Llandudno and District Urban Council. They were fitted with a ratchet brake so as to stop them sliding back on the steep hill of the Great Orme. They were registered CCC 596 and CCC 597. As far as we know CCC 597 was used as a hen hut. CCC 596 was bought by Alpine Coaches of Llandudno in about 1992 and Mike Jones an Alpine Mechanic (and my brother) spent over a 1000 hours restoring it. We travelled to many shows in the 90’s with it and won many trophies. Alpine still own it but it doesn’t get out much these days. Here is a view of CC 8671. This Dennis GL was built in 1929 for Llandudno UDC and carries a J Roberts (not to be confused with Charles Roberts) toastrack body seating 19. She has been in the care of Southampton University for many years – I first encountered her in 1970 – and is seen here taking part in an open day at Brijan Tours of Botley on 22 April 2012. This event is always in support of a local charity, and the 2012 version was in aid of the Hampshire & Isle Of Wight Air Ambulance. When I first encountered the vehicle, she was on the books of the Engineering Faculty, but the lettering has now been altered to Engineering Society. A similar ex Llandudno Dennis GL of 1930 also with Roberts bodywork is based in Whitby and a few years ago was used on the town tour. This was CC 9424. Yes, Chris, I’ve seen and photographed it. I was considering it for submission in future, unless someone else gets in first! CC 9424 is here with ‘Elizabeth’ the steamer behind. www.flickr.com/photos/ There are several photos on Flickr. 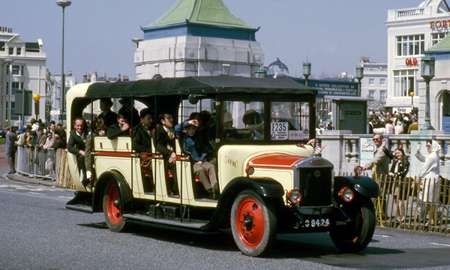 Here is another ex Llandudno Dennis GL of 1930 with J Roberts 19 seat toastrack body, seen on the HCVC Brighton run in May 1970. This is CC 9305, which, like its fellows CC 9424 and CC 8671, was originally delivered as a 20 seater. All the Llandudno Dennis toastracks were downseated in 1932. In some quarters, CC 8671 is described as a G model, rather than a GL. The GL had a slightly longer wheel base, and, while the engines of both models had a capacity of 2.72 litres, that in the G was a side valve motor, and, in the GL, a more powerful overhead valve variant. The G appeared in 1927 and was superseded by the GL in 1929. Here are more pictures of the three surviving ex Llandudno Dennis toastracks, CC 8671/9305/9424 taken on HCVC Brighton rallies. For anyone who might be both interested and available, the 2013 Brijan open day is on Easter Monday, 1 April, from 10:00Hr. The site is just off the A334 east of Botley (and in stone-throwing distance of Botley Station).